With Thuraya DSL High-Speed Internet service, you can stay connected to the Internet, send or receive data at speeds up to 144 Kbps in remote areas. Portability. The Thuraya DSL modem, manufactured by Hughes, is a light and compact (under 1.6 kg) allowing users to carry it easily. The reliable rugged construction of the modem allows it to be deployed in rough conditions. Transparent & Competitive Pricing. Thuraya DSL users are charged based on the amount of data they send or receive, so you can be online as long as you need. Flexible subscription plans. Prepaid subscriptions are available to meet a wide range of usage and budget control requirements. Unlimited data package is available for just $11,995 per month. Compatibility. 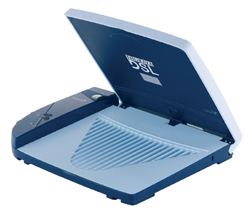 Thuraya DSL is compatible with both Windows and Macintosh (OS X) computers. Remote Office. Connect to an external wireless router to establish remote office environment anywhere in Thuraya's coverage area.